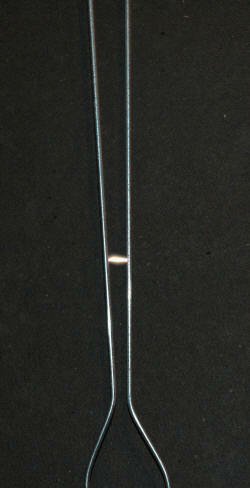 A Jacob's ladder is an arc that forms between two upright electrodes that are wider at the top. The arc starts at the bottom and rises with the heat of the arc becoming progressively larger until it "breaks" at the top. It then reignites at the bottom to start over again. The left photo above shows the Jacob's ladder powered by my original old unpotted NST and shielded with acrylic tube to allow safe public display. This was struck by my TC resulting in mains arc-over in the power switch and fuse and also destruction of the limiting resistors for the indicator neon's. I need a bigger shed. The centre photo shows a 1.6 second exposure showing the arc rising in steps. 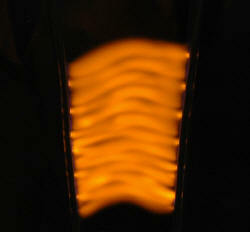 Occasionally there is orange in the spark due to sodium (from salt in sweaty hands on the electrodes). 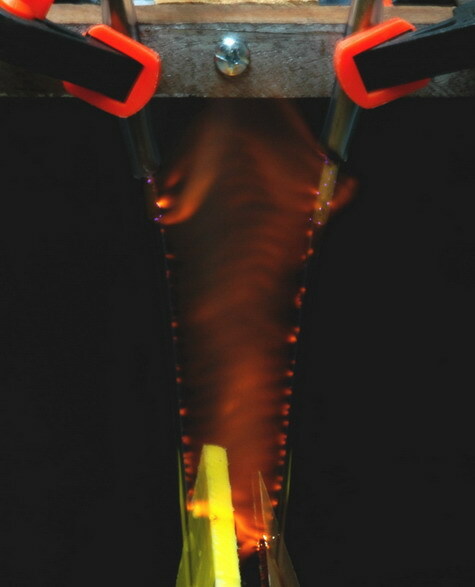 The right photo shows the arc as it rises in a 0.016 second exposure (1/60 sec). 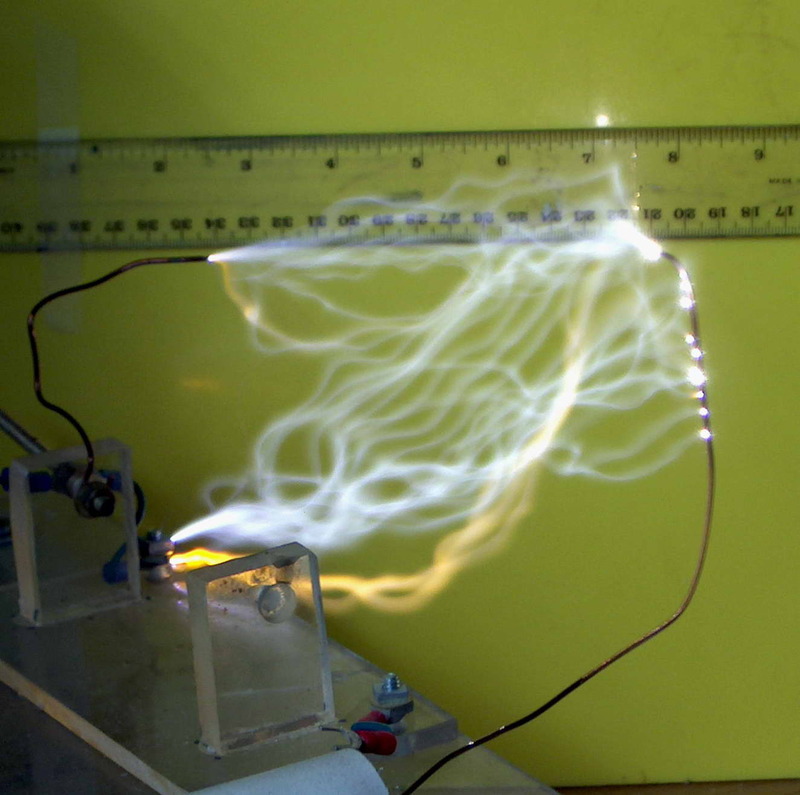 Above shows a Jacobs ladder running off a microwave oven power supply. 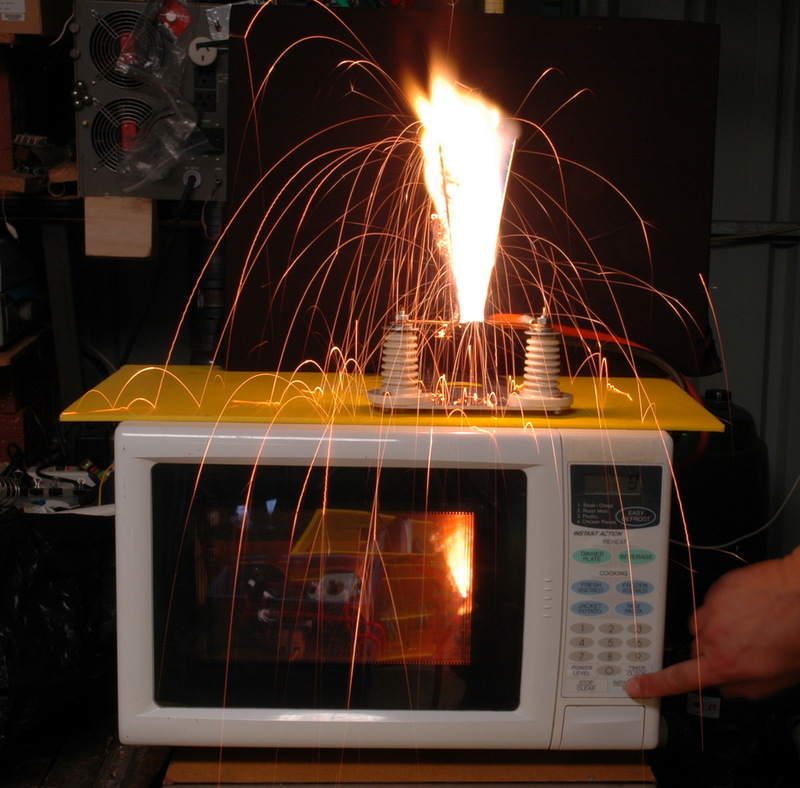 It has a voltage multiplier to allow starting voltages of 10 kV and runs through a 10 K ohm 100 W ballast resistor with the MO set to cook for 10 seconds. 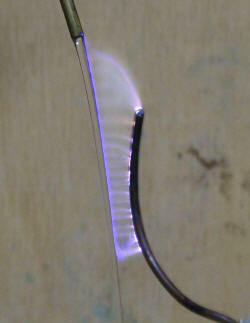 The shot also catches a poor contact arcing internally and burning up the plastic wire coating inside the cooking space. Above shows a one sided ladder using water from our salt water pool. Simple gravity feed siphoning from a plastic tube into a metal nozzle with 6kV NST. Video above shows this in action. 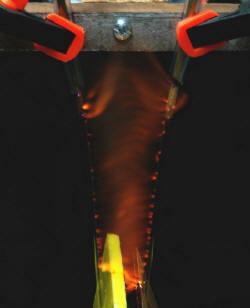 The left photo above shows the Jacob's ladder with dual water streams using seawater powered by a 12 kV NST . Exposure is 1/8 second. See how the sparks are orange with the salt on alternate half cycles. 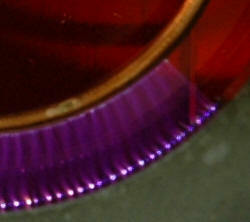 It is only one electrode polarity that gives the color. The centre photo shows a 0.4 second exposure showing the arc rising in steps and the plastic. The right photo shows a 1 second exposure so the spark is only 1/8 as bright as in the first photo. The left photo above shows the Jacob's ladder with dual water streams using seawater. 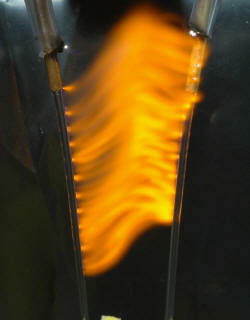 Sometimes if the spark lingers on a pool of salty water it colors the flame much more strongly. 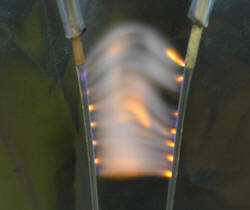 The centre photo shows a the spark with seawater in the left stream and copper sulfate solution in the right. Note the loss of the sodium yellow color. Right photo shows the intense color of the sodium in the ladder. A conventional Jacobs ladder has a spark that moves up as heated air rises. 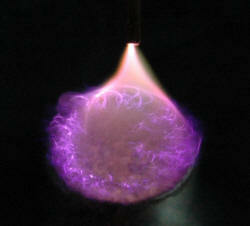 But one can also move a spark by the action of a magnetic field. The photo above shows a spark to a NIB magnet (which is just under water). 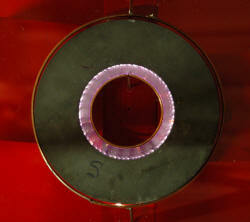 The arc will race around in circles and blur into a conical flame. The reason is the magnetic field resulting in a force on the current flow just like the right (or is that left?) hand rule which is the basis for electric motors. 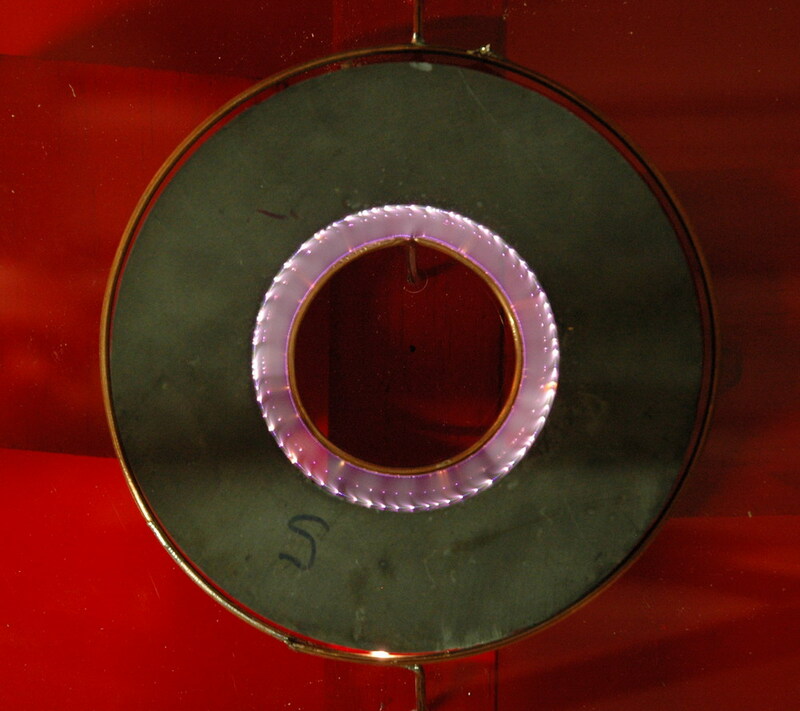 The left photo above shows a circular copper ring close to the inside of a 15cm diameter toroidal ferrite magnet. This happens to be conductive (many ferrites aren't). The S indicates the South pole is uppermost. 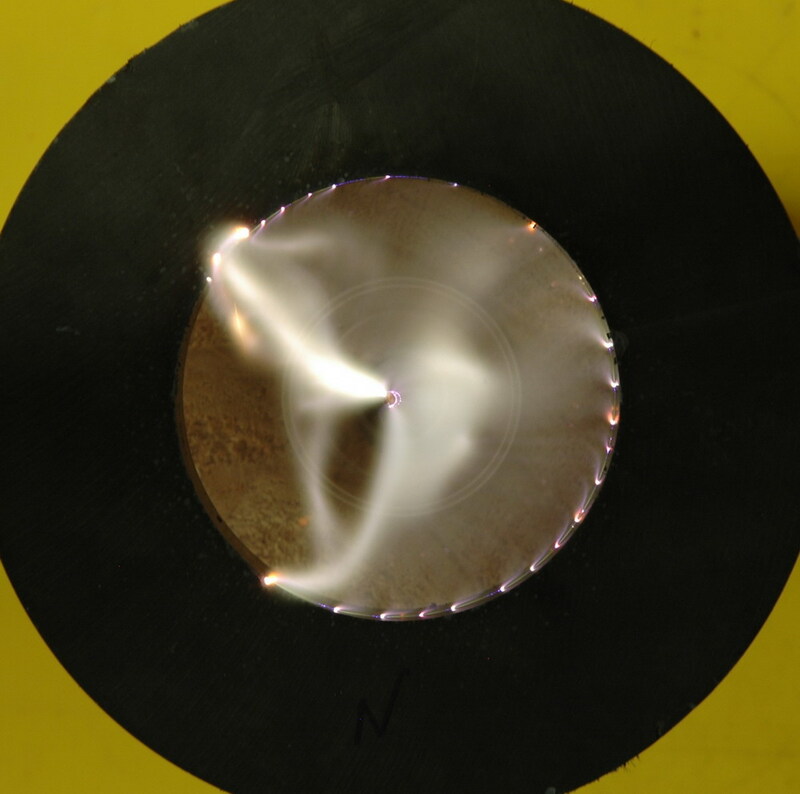 The center photo shows the gap filled with a rotating spark that does several rotations per second if the power is high enough. The right photo shows a close up at lower power. 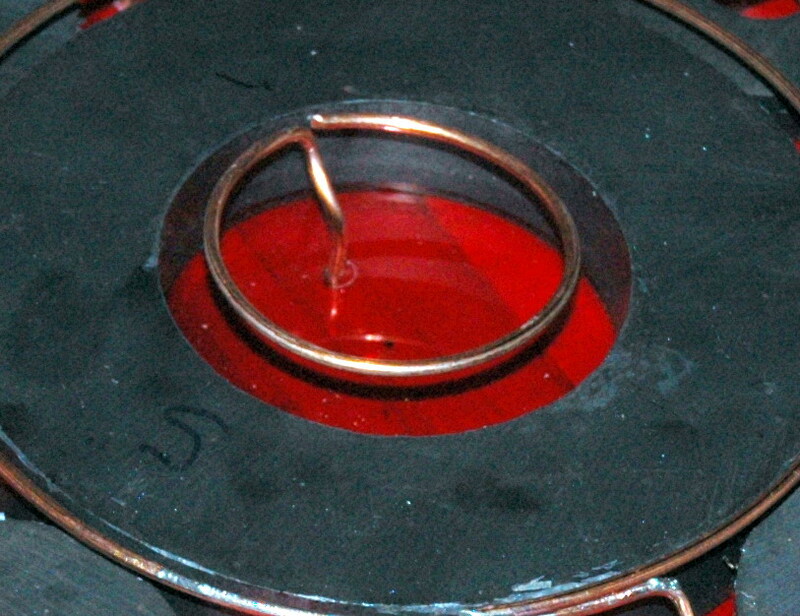 Now consider a ring on the outside of the magnet to create the same on the outside. This is a little harder probably due to the direction of the field lines. However by shaping them with some external magnets (circular ferrite magnets from microwave oven magnetrons) a reasonable circular spark can be obtained. This does tend to decrease the free running of the central hole though. 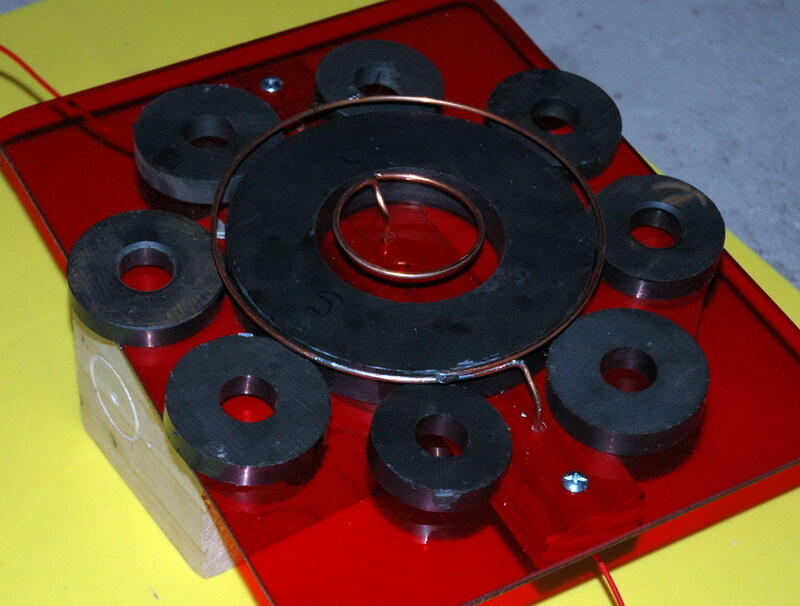 The left photo above shows the dual copper rings, large central ferrite magnet and 8 smaller ferrites. 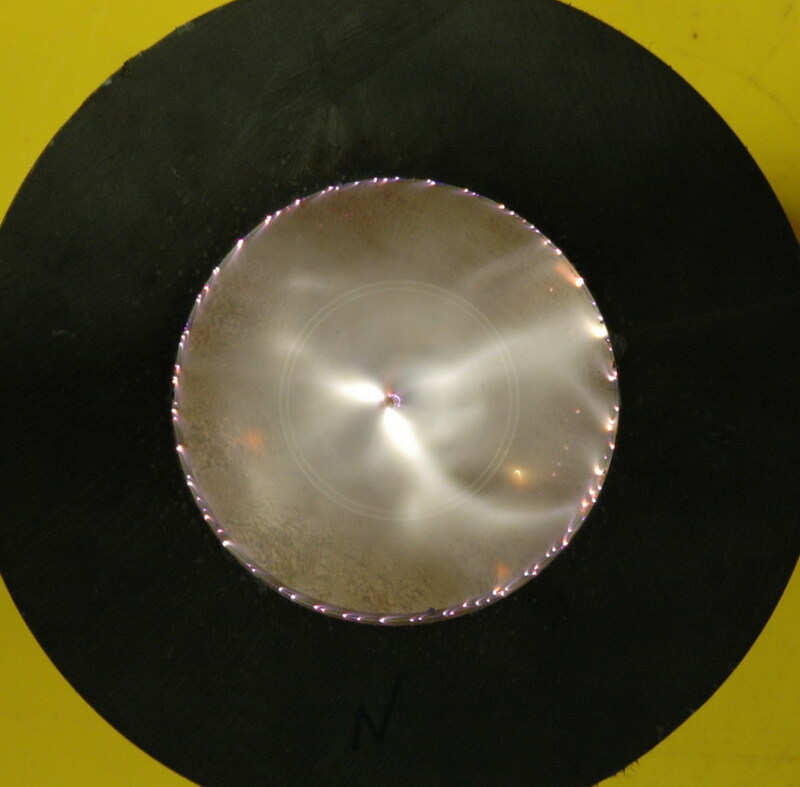 The center photo shows the dual concentric 'circular Jacobs ladders'. The right photo shows detail. The left photo above shows the effect of a single electrode in the center. 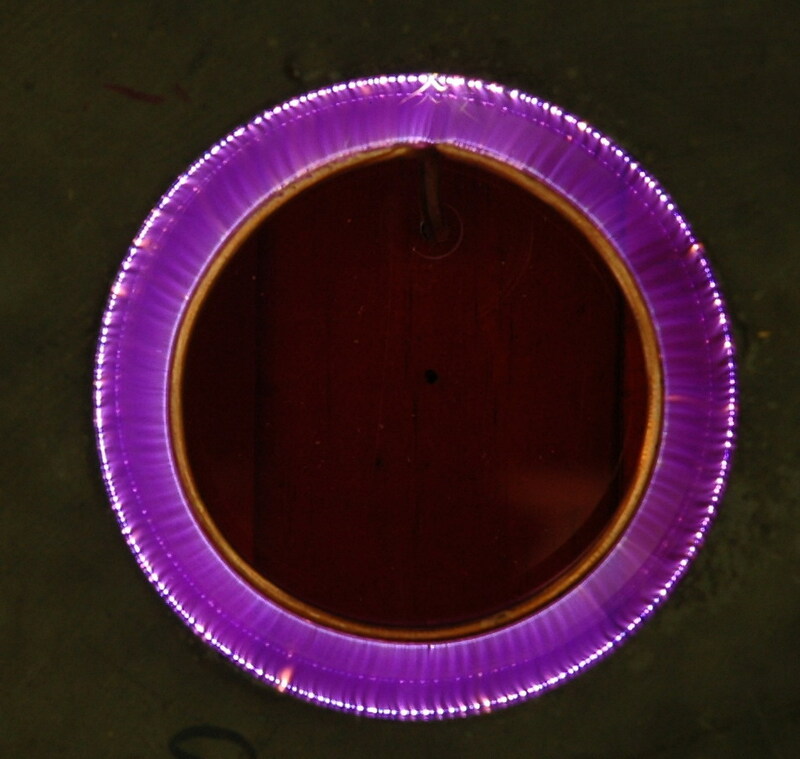 With enough voltage to jump 3.5 cm plus enough current to form a continuous arc, it will spin around rapidly. The right photo shows an exposure lasting a couple of rotations. These yellowish arcs are much longer than the lower powered purple ones above. Of course, if you have 3 kv at 500 A (1.5 MW) available then Lorenz forces are greater than gravity and heating. See this fearsome circular Jacobs ladder. A 500 kV hot disconnect gives a massive 40 foot rising spark. No doubt a good amount of line inductance helps. 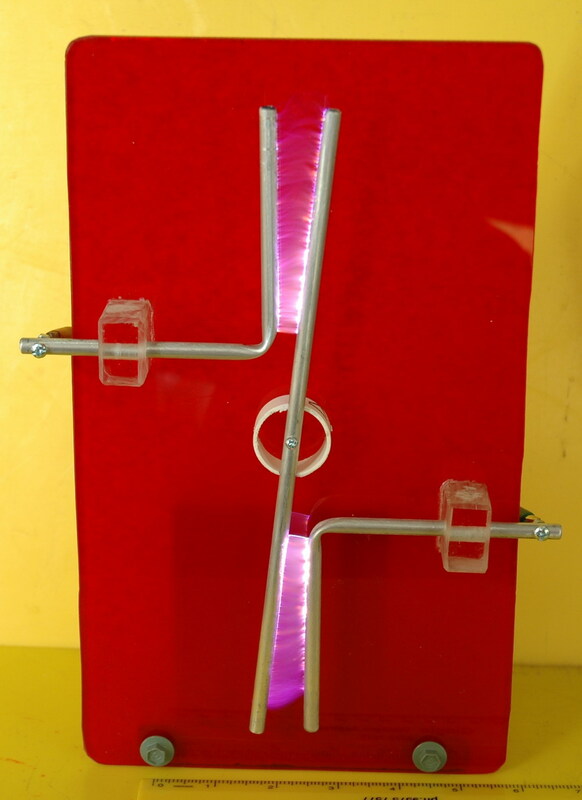 This is a bidirectional Jacob's ladder and has sections that go both up AND down. But how can that be? 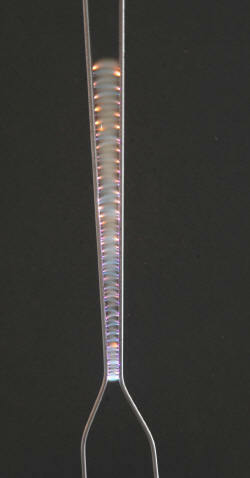 The photo above shows the Jacob's Bi-ladder. 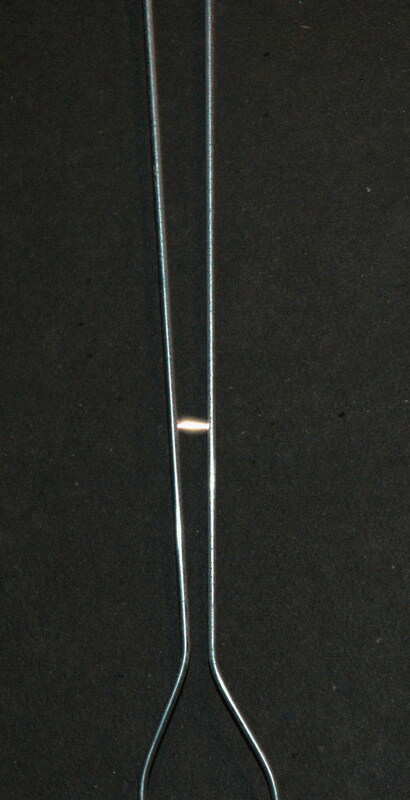 The long central rod can rotate to widen the gap. It was run from my 80 kV DC supply. The photo above shows the concealed NIB magnets behind the red acrylic. Left electrode is positive and North poles are closest. However, after some thought I realize that there is another way to achieve an identical photo without magnets. 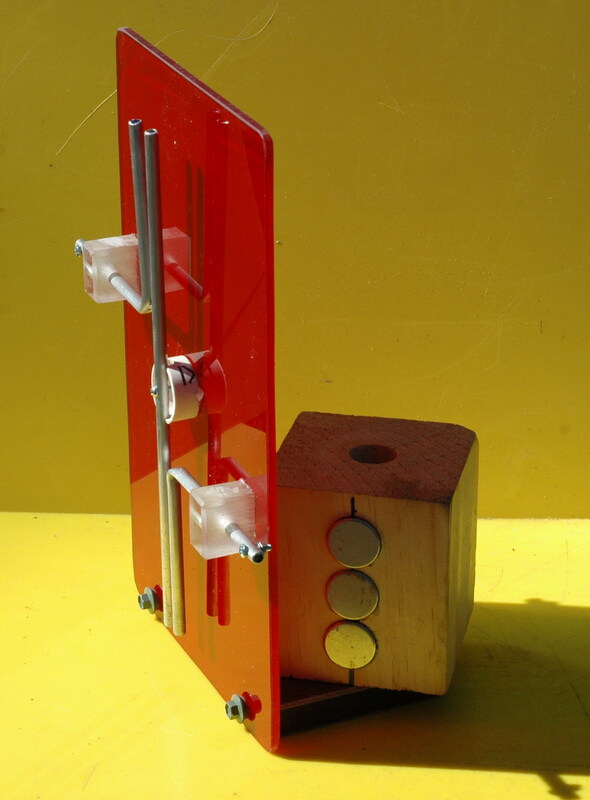 You need this setup in a box containing the camera which are all free to be rotated so they are upside down. 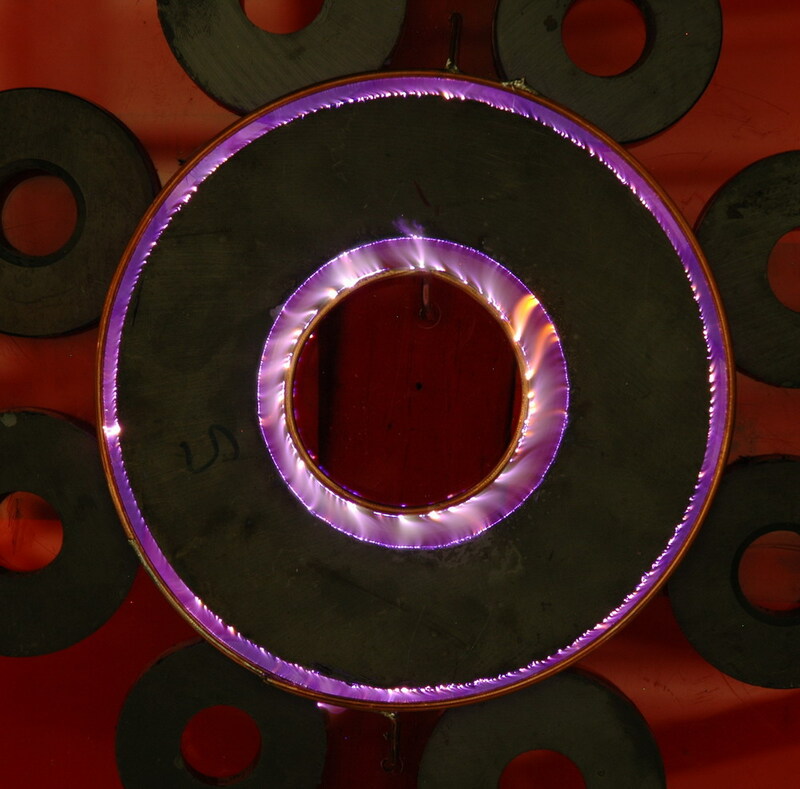 If the ladder is rewired so the sparks are between the central electrode and the uppermost outer electrode, then a long exposure with one rotation through 180 degrees (switching to the upper electrode when it rotates), will give a good result. This is from a small x-ray transformer. This was given to me by a friend who got it for AUD$1 on eBay (Thanks, Ralph). It is from an old dental x-ray machine and is rated at 60 kV. It looks tiny for a mains transformer to give this even under oil. It doesn't have any shunts and can draw 15 A from 240 V. I connected it up and with about half power (125 V) it puts out about 30 kV at 20 mA before internal shorting occurs and the oil starts to bubble. Occasionally it will run to a 2 1/2 inch spark on the full 240 V. It has a lot more power than an NST. Above left is the 60 kV transformer with a bit of suppression circuitry (ex microwave). 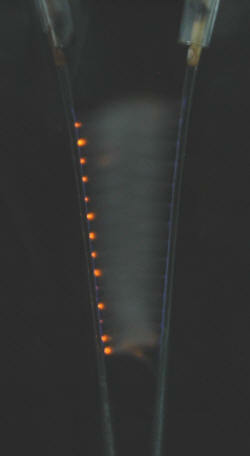 The video shows the transformer under oil in a PVC pipe running as a Jacob's ladder with a drink can next to it for scale. 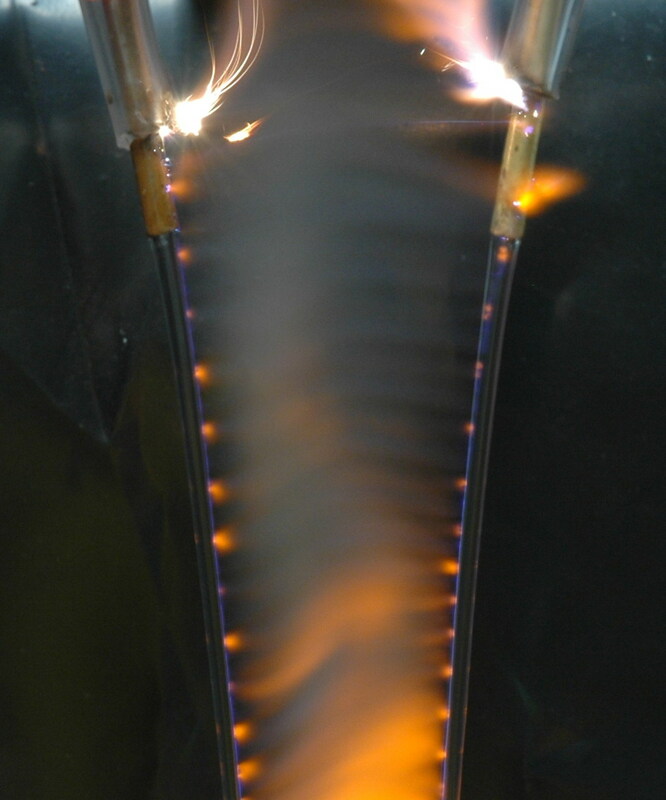 A Jacobs ladder is a spark gap in which a spark forms initially between the lowest and closest points then rises as the plasma heated air rises. It eventually extinguishes near the top then restarts at the bottom. A favourite backdrop for old Frankenstein movies. To obtain around 100 kV DC from this 60 kV x-ray transformer I input 150 V AC which gives 36 kV AC out. 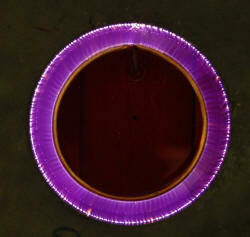 With a diode and a 0.015 uF 80 kV mica capacitor connected as a voltage doubler, around 100 kV DC is achieved giving a best spark of 5 inches (13 cm). Note the spark is hazy (and fairly quiet) due to current limiting with a resistor and an inductor to reduce strain on the capacitor. The whole setup crackles with corona when in action. The spark above is attenuated with a resistor (below right and the short central poly tube in the left photo) which has 67 x 1.8 k ohm resistors and is almost exactly 100 k ohm. The voltage rating is unknown but for these 2 or 3 watt types is probably around 1 kV each. It was placed in a PVC pipe and filled with paraffin wax. I have had these in my junk box for around 20 years so I hope they aren't past their use-by date. The capacitor (the upright tube in the photo) is a 2.2 nF rolled polyethylene in oil cap composed of 2 sections with 8 layers of sheet in each side. I have a 1 3/4 inch (4 cm) safety gap which only starts to fire at output sparks with the voltage doubler of 4 inches (10 cm). This was replaced with the mica caps for the highest voltages. The diode is composed of 290 x 1N4007's in a PVC pipe about 15 inches (40 cm) long. Each one is rated at 1000 PIV at 1 A. This was designed to accommodate the full 60 kV AC = 169 kV peak to peak. Allowing for 10% increased voltage from the variac gives a total 186 kV which allows 50% headroom only. Note no dropping resistors were used. So far no problems (but many lesser ones have come to grief). I now have two of these to allow another stage to my voltage multiplier. 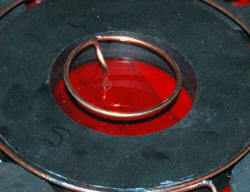 I also have an inductor made from 21 g wire close wound 15 inches on a 1 inch (2.5cm) former. The inductor and resistor are needed to limit the current for devices such as the lifter (below).